I’m an earth protector, a lover of the natural world and seeker of internal peace and of a lifestyle with a lower impact on our beautiful earth. Following a transformative journey to Japan in 2017 (for family reasons), I was left in turbulent thought I found myself in Hiroshima; a city of horrendous disaster having being destroyed by an atomic bomb during World War II on 6th August 1945. Although visiting the museum dedicated to the people and animals killed by the explosion left me deeply saddened, I spent a day in the wonderful Peace Memorial Park absorbing the energy of hope. 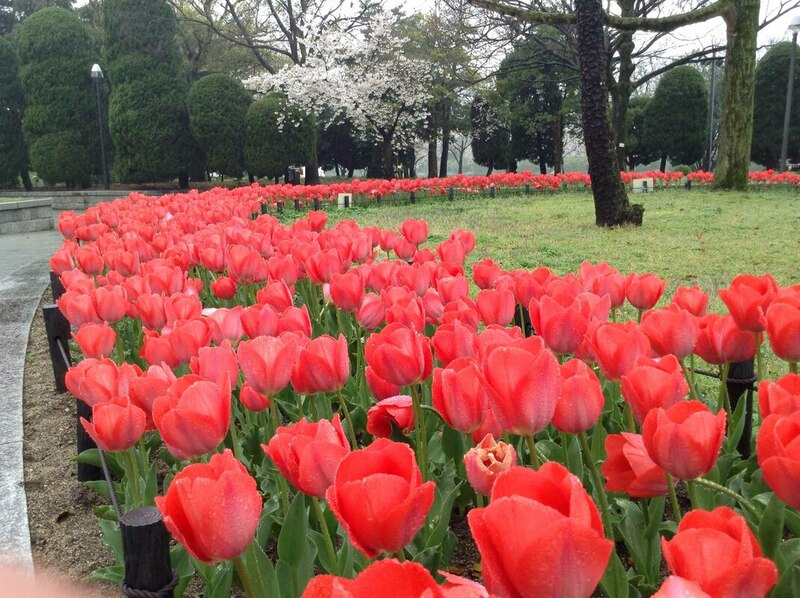 Hope that another atrocity never occurs in the world, for peace, and that all nuclear weapons are banned. I was really struck by the feeling of peace. 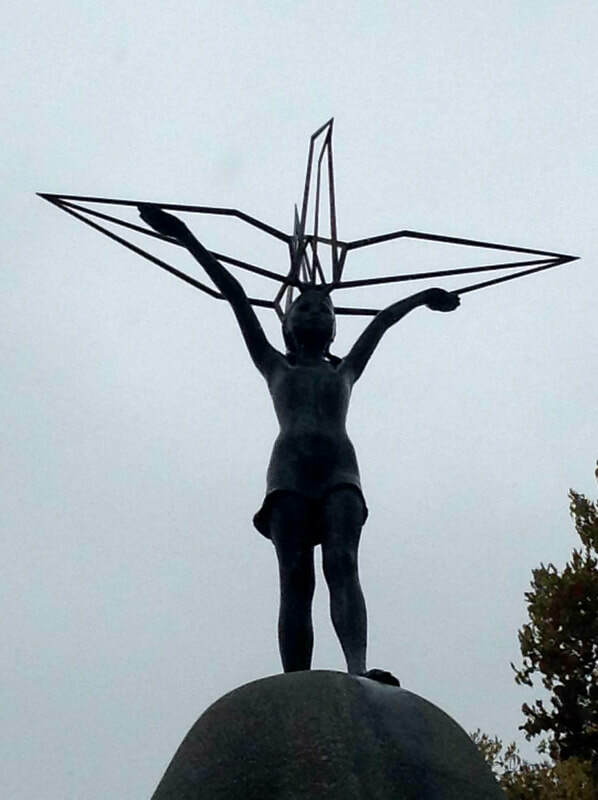 In the Memorial Park in Hiroshima, the Children's Peace Monument captures a girl with outstretched arms holding a folded paper crane above her, depicting strength and freedom. Surrounding her are glass cabinets stuffed full of origami paper birds – thousands of them made in memory of the children who died. Thousands made by children around the world, who also hold onto that peace and hope for their future on our planet. 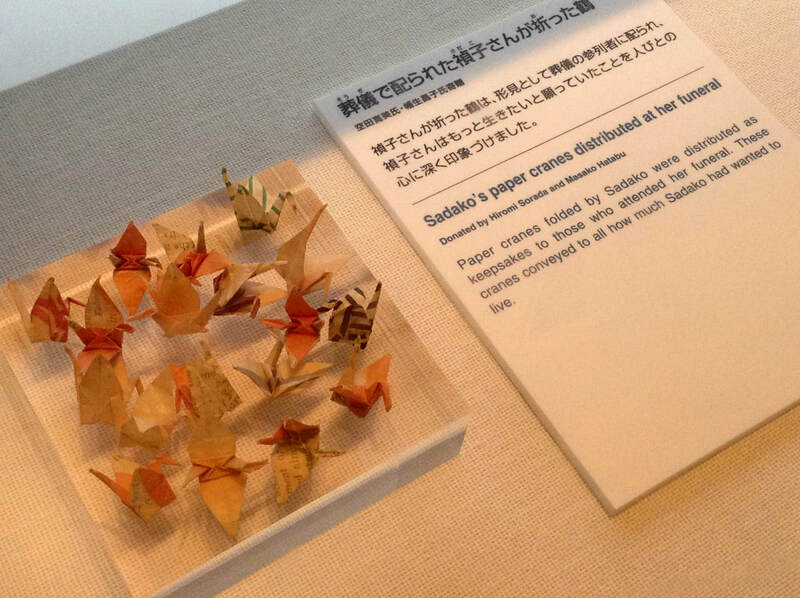 The making of paper cranes originally came from Sadako Sasaki, a young girl who died from the radiation from the bomb. She believed if she made 1000 cranes, she would be cured. A belief of peace. On The International Day of Peace, also known as World Peace Day on 21st September 2018, I launched my own mission to make 1000 unique origami birds of peace. World Peace Day in 2018 celebrated the 70th anniversary of the Universal Declaration of Human Rights: "The Right to Peace - The Universal Declaration of Human Rights at 70." The birds I create are an alternative design to the traditional Japanese origami cranes. This project is growing organically, as I see good purpose for the #1000PeaceBirds. A series of the origami birds have been made with love in my heart for all those who suffered in Hiroshima, and hope for a future free from nuclear war. Some are being made for other causes; all raising awareness of a need for more peace on earth, such as climate change, extinction of birds and sharing my skills so others can create their own version of the Peace Birds through free workshops. A number of Peace Birds are made for friends, family and others; beautiful and meaningful gifts with the intention to pass on the energy of peace. 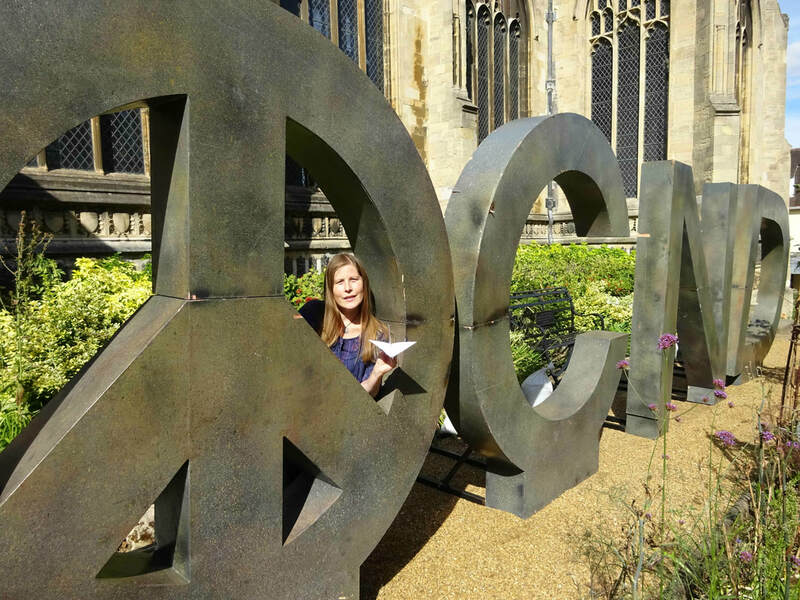 In 2018 it was the 60th anniversary of CND and I was honoured to stand next to the internationally recognised giant three-dimensional peace symbol which came to Norwich on 11th August 2018. Following this, I’ve created unique lino-printed designs and hand-printed these onto recycled brown origami paper (sized 10x10cm), printed using vegan ink, with cotton yarn and glass beads. The single birds’ tip to tip wing span is 10cm, and the mobiles consist of three birds in a row and are approx. 37cm in length from top of string to bottom of bird. The intention behind the Peace Birds is to raise money for CND - Campaign for Nuclear Disarmament and on completion of my #1000PeaceBirds project (or when all of these birds in this series are sold), a percentage of the sales will be donated. If you are interested in buying a single Peace Bird or Peace Bird mobile, please complete the form below. They are posted in a recycled card envelope. They are also available for purchase from the SOAP at No. 29 stall on Norwich Market. Please get in touch with your requirements and you will be contacted with pricing and further details. Please detail the print/s you require or any other queries. Learning about climate change and this catastrophic environmental disaster which is affecting all life on earth, I have felt compelled to raise awareness by creating a series under the umbrella of the organisation Extinction Rebellion. From 12th April 2019, I was grateful to have a voice through my #1000PeaceBirds and my submitted message was read out as part of the #LettersToTheEarth campaign across 52 theatres, arts venues and community spaces nationwide. My intention is to help do something to save our beautiful planet and bring peace on earth through education and awareness. 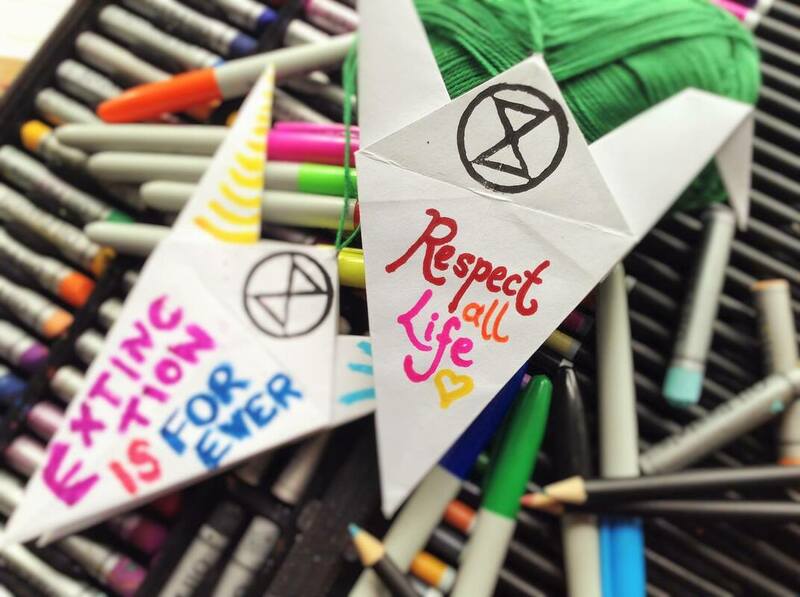 In April 2019, I have put on two workshops in Norwich to teach others to fold the origami Peace Birds and encourage them to write their own messages about protecting our planet (and birds) from the climate emergency. A little bit of gentle craftivism! Old re-purposed printing/photocopying paper is being used, alongside donated second-hand art materials. 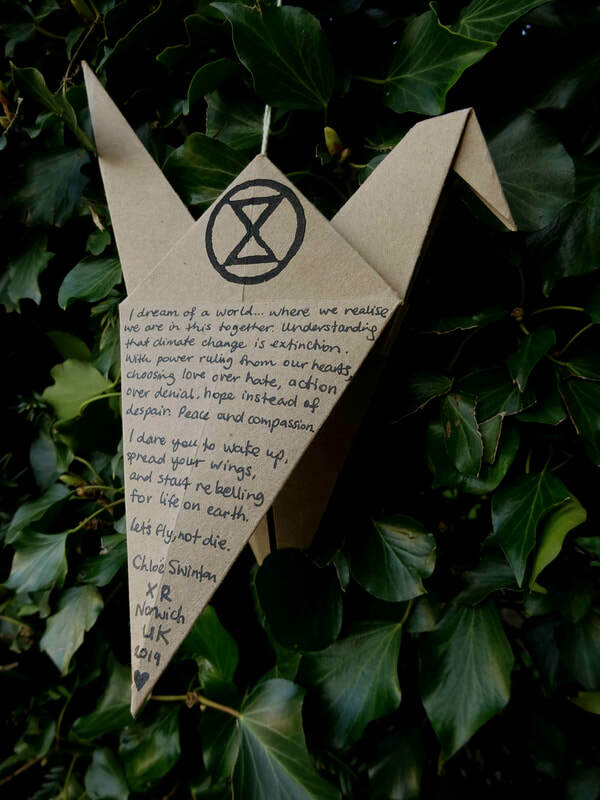 All the #MessengerBirds will travel down to London over the 2019 Easter weekend to be displayed during International Rebellion - this event organised by Extinction Rebellion and demands the government takes necessary action on the global climate and ecological emergency. Everyone is welcome to join the free workshops in Norwich on 17th and 19th April 2019. You can follow my journey on Instagram, or view the latest birds at the bottom of this page. 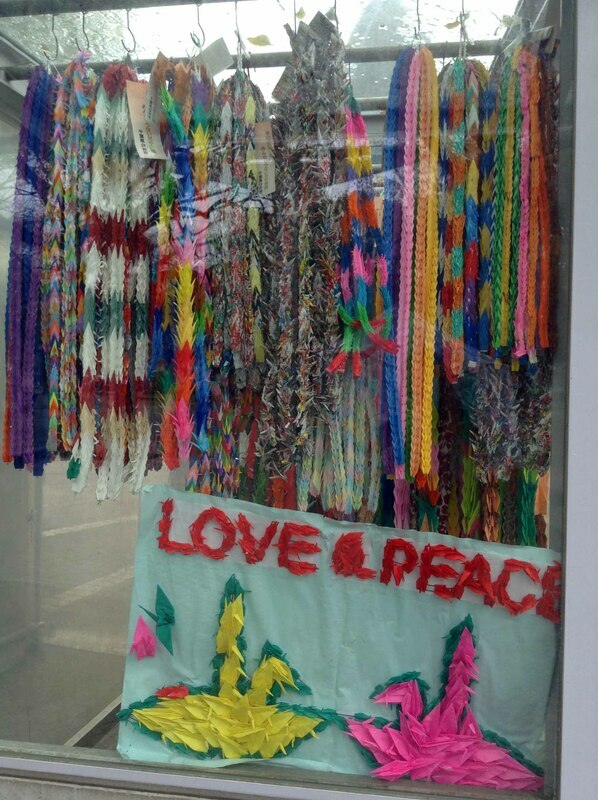 If you have any comments regarding my #1000PeaceBirds Project, please get in touch. I'd love to hear from you. March 2019 (6 months since launch), I’ve made 492 Peace Birds!